The 1950s were a period of reform and reconstruction. Already a few years after the war, on May 3rd 1947, a new constitution was proclaimed, which meant the start of a genuine constitutional party democracy. But with the merger of the Liberal and Democratic conservative parties in 1955, resulting in the LDP (Liberal Democratic Party), a virtual one-party state was the result. From 1948 to 1954 Prime Minister Yoshida Shigeru had dominated Japanese politics, and it was his successor, Hatoyama Ichiro, who presided over this merger. The challenges facing the government were huge. After the establishment if the MITI (the Ministry of International Trade and Industry) in 1949 it was decided to focus recovery on four industries: coal-mining, steel, ship-building and the chemical industry. The Korean war (sometimes referred to as “the gift from the gods”) helped economic recovery. In 1955 The US GNP (Gross National Product) was sixteen times that of Japan. Twenty years later, in 1974, it was only three times that of Japan, and Japan had become the second-largest economic power. In the field of foreign politics Prime Minister Hatoyama restored political relations with the Soviet Union in October 1956 after lengthy negotiations. Along with those for the San Francisco Peace Treaty and the Japan-U.S. Security Treaty concluded under the Yoshida Cabinet in 1951, these negotiations and subsequent agreements with the Soviet Union can be regarded as one of the two most significant diplomatic events in Japan's postwar history. 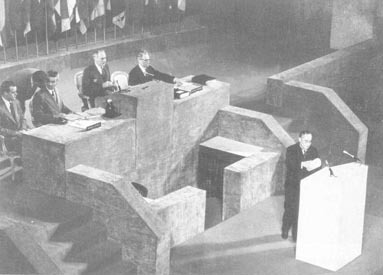 and Peace" at the San Francisco Peace conference in 1951.
n the same year, in December 1956, Japan was accepted into the United Nations. In 1960 Prime Minister Ikeda Hayato, a former minister of MITI, proclaimed the “Income Doubling Plan”, set to more than double Japan's gross national product in the course of the next decade and bring Japanese standards of living up to levels comparable to those found in many advanced Western countries. In fact these goals were achieved in only four years and the "Golden Sixties" (Ogon no Rokuju Nendai) were the result. Japan’s economic recovery can be compared with that of Germany after the war. The Wirtschaftswunder (economic miracle) also transformed Germany from a post-war wasteland into one of Europe’s leading industrial nations in more or less the same timespan. Then, as a bolt from the blue, Kiyoshi Saito won a first prize at the São Paulo Biennale in 1951 with the print “Steady Gaze”. 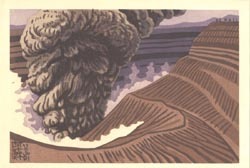 This prize coincided with Oliver Statler’s work to promote Sôsaku Hanga, and with the lifting of travel restrictions for Japanese artists as a result of the San Francisco Peace treaty of that year. Soon more Sôsaku Hanga prints were sold outside Japan than in Japan itself. It became possible for many artists to live from the proceeds of their work, and to create work more in keeping with their artistic inclination. For instance, after the war Onchi Kôshirô completely turned to abstract art – during the war abstract art had been banned. 1957 saw the first Tokyo Print Biennale, the first large print exhibition in Japan that showed work by both Japanese and foreign artists. By this time Tokyo was also ready to receive visitors from abroad. 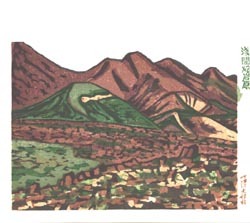 The fifties saw two new developments: Japanese print artists started travelling to the West, where they exhibited their work; they also became teachers or even settled there, like Hiratsuka Un’ichi, who started to live in Washington D.C. in 1962. 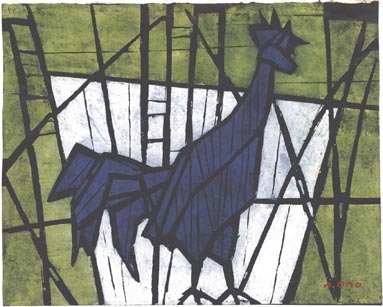 In the 1950s woodblock print artists increasingly made use of sheets of plywood, which resulted in larger prints, and the prints that were made were often made in larger editions to meet the demand of the growing number of collectors. These collectors also became interested in the prints made before WWII. Simultaneous with the rise of Sôsaku Hanga, Shin Hanga was slowly losing its importance: Yoshida Hiroshi died in 1950, Kawase Hasui in 1957, and their best work had definitely not been made after the war. There were no successors of any importance, and the pre-war brilliance of Shin Hanga was gone forever. The above print is a good example of Ono Tadashige's later work, which was to flourish in the 1960s.